Varieties that complete their life cycle in one year or less, requiring sowing every year. Annual flower varieties often bloom profusely and over a long period of time. Varieties, both flowers and vegetables, that complete their life cycle in two years, usually just showing only leaf growth the first year, and flowers the next. Young, leafy vegetables or herbs that are harvested at 2"–4" tall. 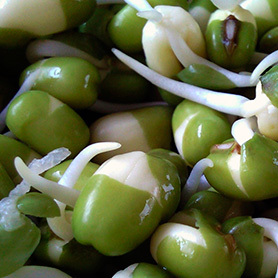 The condition of premature flowering in edible crops, often making the plant unpalatable. Cucumbers that do not produce, or produce very little of a chemical called cucurbitacin, which produces a slight bitter flavor mainly concentrated in the skin and causes minor indigestion in some people. A four-sided frame placed on the ground or in a garden bed that has a clear top. By design, it increases temperatures over the ambient temperature and is used for growing seedlings for transplant or for food crops, extending the harvest season. Planting different plants together that benefit one another. For example, sowing a plant that attracts pollinators next to a plant that requires pollination. Organic material often made from decomposed/broken down plant material. 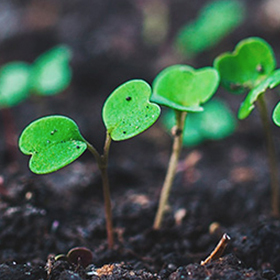 Compost can be used to replenish soil nutrients and introduce soil biology to a growing area or simply to reduce landfill waste. Fast growing plants, usually grains, legumes, or grasses that are utilized for one or more of their soil-enhancing qualities. These crops are usually worked into the soil or removed before they produce seed. A plant that is cultivated for harvest, like cut flowers or vegetables. A species that was selected or bred by humans for a particular feature. Cultivars carry a specific name in addition to the scientific name and/or common name, e.g. Brandywine. Number of days, on average, that it will take a seedling to emerge from the soil or media in favorable conditions. Number of days from sowing (or transplant) to harvest. Cutting spent flowers off a plant, encouraging the plant to bloom again; extending the bloom period. Describes tomatoes that stop growing when fruit begins forming from the topmost flower bud, making them more compact at around 3'–4'. Most of the crop ripens within a couple weeks time, making these a great choice for canning. 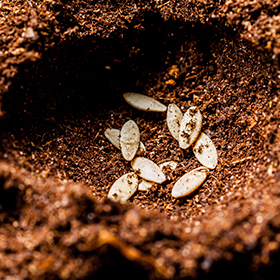 Sow seeds directly in their permanent growing space. Exhibiting less susceptibility or an immunity against specific diseases as compared to other varieties. Better ability to thrive with the stress of infection as compared to other varieties. Ability to survive or thrive in low water conditions. Also known as "water-wise." Characterized by lanky, weak, pale plant growth, resulting from low or no-light conditions. Ability to survive or thrive in low water conditions, but to a lesser extent than "drought tolerant" plants. Crops that tolerate some cool weather and even frost, although the amount of tolerance varies between crops and even varieties. Crops that are not frost tolerant and will die as a result of exposure to freezing temperatures. A seed capsule that emerges from a flower, such as a tomato or melon. Six or more hours of sunlight. The moment when a seed begins to grow. Stands for Genetically Modified Organism. Commonly means genetically engineered, indicating that the variety was manipulated at the gene level in a laboratory. A plant with only female flowers. A pollinator plant with male flowers is required for fruit production. These varieties are generally very productive and fast to mature. The 7 to 10-day process of acclimating plants started indoors to outdoor conditions. The degree to which a plant can withstand cold temperatures. The ability to resist heat-triggered issues like poor pollination, bitterness, premature flowering, and lack of fruit-set. Botanical Interests considers open-pollinated varieties over 50 years old to be heirloom. Modern F1 (filial 1) type hybrid. Two specific parent varieties are bred to achieve a first generation hybrid offspring. F1 hybrids are not open-pollinated. Traditionally, "hybrid" indicates any variety that had been made by cross-pollinating, even if that was completed by hand or an insect. Describes tomato varieties that continue to grow and produce tomatoes all season until first frost: therefore, you can find tomatoes at all stages on the plant at one time. Also called "pole" tomatoes because supports are helpful in guiding plants that can easily reach 6' or more. The two or more part name that is unique to a specific species. Scientific names are consistent in any language, whereas a species may have several common names that may even vary by region. The material plants grow in. 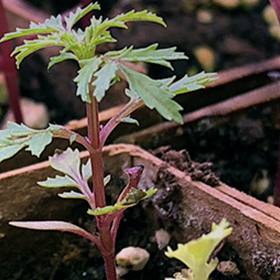 Young, leafy vegetables or herbs that are harvested just above the soil line when the plants have their first pair of leaves, called cotyledons, and possibly the just-developing true leaves. A plant that produces both male and female flowers. Botanical Interests identifies varieties that are native to the U.S. as "native". Describes seeds grown on certified organic property, following strict USDA guidelines regarding soil quality, pest and weed control, and the use of additives like fertilizers. Varieties that produce seeds that are "true", growing into nearly identical plants as the plant they were harvested from (if they are not cross pollinated). Unless a Botanical Interest variety is identified as a hybrid, it is open pollinated. 3 to 6 hours of sunlight. The attribute of a variety producing fruit without fertilization. Cultivars produce seedless fruits when flowers are unpollinated, making them ideal for greenhouse production where pollinators may be excluded. When pollinated, these types produce seeded fruit. Often parthenocarpic types have a high percent of female flowers. Varieties that live for two or more years. Refers to a reaction some organisms have to the length of day or night. In plants this reaction is usually flowering. The fertilization of a flower by wind, insect, birds, etc. where the male pollen reaches the female stigma, resulting in a seed, sometimes surrounded by an edible fruit like a pepper. An organism that transfers pollen. Fabric that is used to either exclude pests or raise temperatures of the area beneath it. "Remay" is a type of poly-spun row cover material commonly used in farm and garden settings and it comes in several different thicknesses. Row covers may or may not have hoops under it to create a "low tunnel". The process of breaking through a hard outer covering of a seed to allow moisture to penetrate. To drop viable seeds to the ground. In some varieties, often annuals, if seeds are allowed to drop, those seeds will germinate, perpetuating the variety. The subsequent seedlings are often referred to as "volunteers". Growth type of tomatoes that falls between determinate and indeterminate types. They produce a main crop that ripens within a couple weeks, but also continue to produce up until frost. Germinated seeds that are not grown in media but instead rinsed in water and drained several times a day. The process of subjecting seed to a moist/cold treatment to break dormancy, which occurs naturally when seed is sown outdoors in the fall and experiences a winter period. Extending the harvest in one of three ways. 1. Staggering sowings of the same crop 2. Sowing two varieties of the same crop with different maturing dates 3. Replacing one finished crop with a different crop. A perennial that is not cold hardy in all zones. For Botanical Interests purposes, perennials hardy in only USDA zones 7 and higher are called tender perennials. The act of reducing extra seedlings so that remaining plants are spaced properly. Transferring a plant to a different growing space. Seed that does not have a chemical treatment such as fungicide applied to it. The historical, average, lowest winter temperature in specific US areas. Perennials are rated using the USDA zone system, indicating the coldest zone in which they can survive. A species that has naturally formed a unique characteristic, for example from cabbage (Brassica oleracea) came kale (Brassica oleracea var. viridis) and kohlrabi (Brassica oleracea var. gongylodes which both adapted unique, characteristics that differ from cabbage and so the variety ("var.") name was added to the species name. A cold treatment, such as found in cold winter conditions, that induces flowering in some varieties. A plant that emerges from being self-sown or sown by an animal rather than by the gardener.